We know that being married to a law enforcement officer (LEO) has its challenges. But how does extended exposure to secondhand stress and trauma affect the children of LEOs? According to a 2002 study led by Rudy Arredondo, law enforcement children "can develop traumatic stress vicariously" through watching and listening to their parents experiencing symptoms of post-traumatic stress disorder (PTSD). This exposure can cause symptoms such as hyperarousal, intrusive thoughts, eating disorders and aggressive agitated behaviors. Children can even share the same memories or re-enact the LEO's trauma by knowing that a traumatic event was experienced by the parent. Law enforcement parents with prior training in stress management techniques after experiencing a traumatic event are less likely to transmit these symptoms to their children because they recognize their own stress responses. Not all children will experience or transfer their parents' stress; however, it is something to beware of after a law enforcement parent experiences a traumatic event. 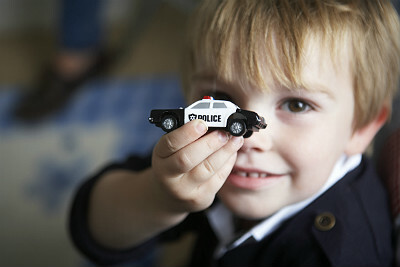 The law enforcement child will go through many different stages of acceptance of his/her parent's law enforcement job depending on age and cognitive development. Openly communicating with your child is the best approach to helping relieve stress of the unknown. Fear of the unknown and worrying about a parent's safety will affect a law enforcement child at some point. It is easy to see that law enforcement children can be worried about their parent's safety when there are so many police television shows, violent police/criminal video games, police and crime-related news stories exposing and discussing the dangers of the job. Watching for signs of anxiety in a child when the law enforcement parent is preparing to go to work is a clue that the child is experiencing stress. A child's anxiety is displayed in many different behaviors such as sudden unprovoked crying, mean or angry talk (unusual for the child), or acting needy and clinging to the law enforcement parent getting ready to leave the home for work. In a law enforcement family, firearms and other police equipment are present in the home. Safety is always a concern with law enforcement families when it comes to duty weapons, your children and their visiting friends. There is less stress about law enforcement weapons when safety is discussed and role-modeling good firearms safety habits is witnessed at home. You want young children to understand the reality of weapons and teach them respect for firearms without instilling fear or accidentally causing additional stress. That can be a tough balance when the children are younger, so law enforcement parents must use their judgment on when the time is right to have the firearms talk with your children. Stress will affect the law enforcement family through their beloved LEO. This is normal, but when the stress is not managed, it can escalate to unhealthy habits and behaviors. Stress and witnessing human traumatic events is the nature of the law enforcement job, but the stress does not need to be consuming if you openly communicate and seek help if needed. Learning to recognize signs of stress in your loved ones is the first step to helping with the stress response. Children are no different when it comes to stress management. Everyone processes stressful events differently. Younger children just need help processing their feelings and help with stress management techniques. Parents can help the child's process with guidance, reassurance and love. A healthy law enforcement family provides the stability and strength for the LEO to perform his/her sworn duty. The law enforcement home is the safe sanctuary of support and love, and it is the place to spend quality time enjoying the gift of family. Managing stress brings balance to the demands of the career and family relations.